Did Jesus lie about the Flood? 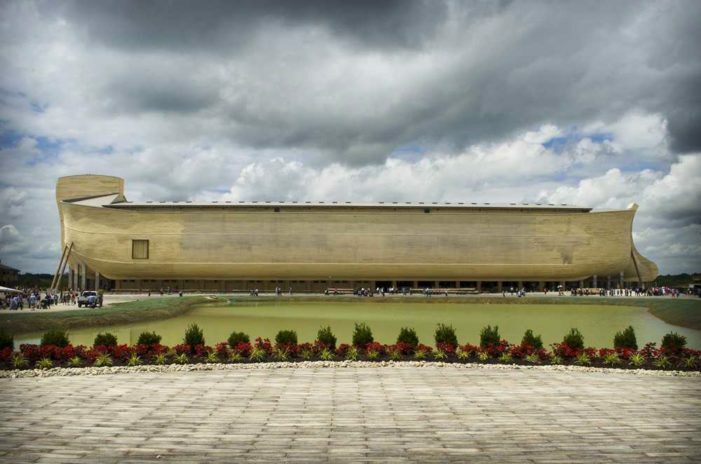 Our friends at christiannews.net posted this article regarding Ken Ham’s assertion that Jesus’and the Apostles’ references to Noah and the Flood constitute proof of the literal interpretation of the Flood story in Genesis. His point is that, if the Flood is a myth, then so is the Gospel. My understanding of this reasoning is based on the assumption that Jesus of Nazareth, being entirely God, was therefore omniscient and would be lying if the Flood story weren’t literally true. He was omniscient and spoke of a true literal Flood. He was omniscient and spoke of a literal Flood when He knew that it was only a story, in which case He lied and the Gospel is a myth. He was not omniscient and spoke of the Flood as any other Jew of the time might understand it, as being literally true. He was not omniscient spoke of the Flood as any other Jew of the time might understand it, as being a story. Postulates one and two are Ham’s dichotomy and are entirely predicated on the assumption that Jesus, being God, was omniscient. But there is evidence in Scripture that Jesus Himself may not in fact have been omniscient which thus allows for postulates three and four. We focus on Jesus’ divinity but don’t always see the correlate, namely God’s carnality. If Jesus was tempted “like us in all ways, except for sin,” He clearly shared our carnal nature, although untainted by original sin. … Abba, Father, all things are possible unto thee; take away this cup from me: nevertheless not what I will, but what thou wilt. Knowing that God the Father had spared Isaac, perhaps (and this is only speculation) He might have wondered if the Father would likewise spare His own Son. He clearly speaks as having His own will apart from the Father. In any case, it is clear that there was at least a sliver of uncertainty regarding the Father’s will, and a sliver is all it takes to render moot the question of omniscience. So having established that God incarnate might not be all-knowing, we can allow the possibility that Jesus may have been referencing the “time of Noah” and the Flood according to the prevailing understanding of devout Jews of that time. Whether they saw it as literal or metaphorical is not a question with a direct answer. But it really makes no difference. It still obviates the necessity for a literal Flood. Let me take pains to affirm that Mr. Ham’s reasoning is not in itself wrong except as it fails to take into account a fuller range of possibilities. My greater concern is that, in setting up a literal Flood as a litmus test for being a Christian, he may be turning some away from a saving knowledge of Jesus Christ who might otherwise have been saved if not for such rigidity.